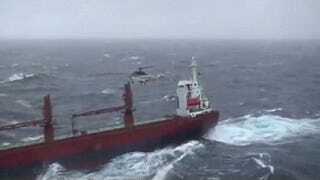 Watch This Crazy Icelandic Coast Guard Helicopter Rescue! The North Sea is one brutal place. It can make a ship that displaces tens of thousands of tons bob around like a rubber ducky. Subsequently, the Icelandic Coast Guard has the job of operating daily in this horrific environment, and they are damn good at it too. Operating a pair of Super Puma helicopters and a Bombardier Dash-8, the air arm of the Icelandic Coast Guard is very small but the territory they cover is huge. As a result of this predicament, their Super Puma crews see a ton of action, and rarely is it under flat water and unlimited visibility conditions. Check out the wild video below of one of their two Pumas pulling off an elaborate dance of timing, intuition and bravery.